LAST FINAL GAME DETROIT TIGER STADIUM photo picture art poster print for sale. 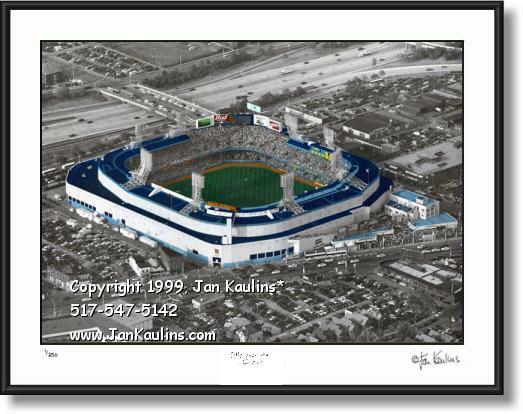 FINAL LAST GAME DETROIT TIGER STADIUM LAST FINAL GAME aerial picture print photo fine photographs art for sale. THE LAST GAME at Detroit Tiger Stadium was on Sept. 27, 1999 shown in this picture photo artwork photography print for sale. Old Detroit Tiger Stadium Last Final Game aerial wall art photo poster picture prints for sale in DETROIT, MICHIGAN -Last Final Game at Detroit Tiger Stadium aerial picture photo photograph - Final Last Game Old Detroit Tiger Stadium photo picture photography art prints for sale: This historic Detroit aerial photo, a picture of old Detroit Tiger Stadium photo, is made from an original HAND-COLORED BLACK AND WHITE PHOTO by nationally recognized artist/photographer Jan Kaulins. This Detroit Photo Gallery photo of old Detroit Tiger Stadium is an exceptional Detroit Tiger Stadium aerial picture photo of the final last game ever played at historic old Detroit Tiger Stadium on September 27, 1999. In this fine-art hand-colored black and white aerial old DETROIT TIGER STADIUM FINAL GAME photo is pictured old Detroit Tiger Stadium filled to capacity of 46,846 seats as thousands of baseball fans, for the final time at Michigan and Trumbull, await the last final pitch at this downtown Detroit, Michigan baseball stadium landmark--the old Detroit Tiger Stadium field of dreams. In the Detroit Tiger Stadium aerial picture photo of this Last and Final baseball game at old Detroit Tiger Stadium, the Detroit Tigers, with a spectacular grand slam home run, blasted the Kansas City Royals with a score of 8 to 2. This Detroit Tiger Stadium aerial picture photo is a historical photograph print of the end of an era of old Detroit Tiger Stadium baseball, played at 'The Corner' in Detroit, Michigan. You can easily find the cheap common poster reproduction posters of the final pitch at Detroit Tiger Stadiuim--this is not one of them. This is an original hand-printed photo by the artist and photographer, signed and numbered by him and offered only by The Detroit Photo Gallery in a very Limited Numbered Edition. PLEASE NOTE: The Limited Edition 11x14 photo in 16x20 matt size is sold out, but due to popular demand the artist has decided to print a small 100 piece run of ARTIST PROOFS. These are exactly the same photo that was in the numbered edition, but instead of being numbered there will be the hand written letters A/P in the bottom left corner beneath the photo, designating that this is one of the artist proofs of which only a total of 100 will be printed. The other sizes in the numbered edition of this historic photo are still available. TO SEE THE MANY OTHER DETROIT PHOTOGRAPHS FOR SALE IN THE DETROIT PHOTO GALLERY, INCLUDING DETROIT AERIAL PHOTOS, DETROIT LANDMARKS, HISTORIC DETROIT PHOTOS AND DETROIT SPORTS PHOTOS, CLICK ON THE 'HOME - Return To All Galleries' LINK BENEATH THIS PARAGRAPH IN COLORED BOX AND THEN CLICK ON 'DETROIT PHOTO GALLERY'.